June 27: Cat’s Corner Field Trip to Local Edition, SF! – Swing or Nothing! 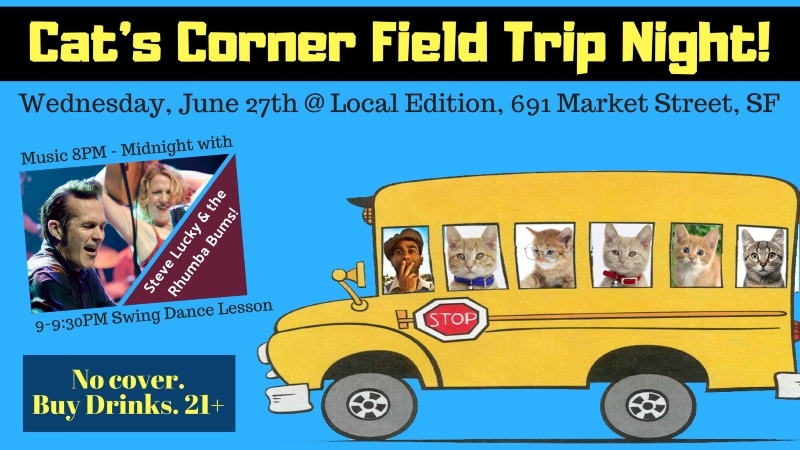 June 27: Cat’s Corner Field Trip to Local Edition, SF! Swedish American Hall is closed for one week. Cat’s Corner takes the dance party on the road! Join all your favorite cats and kittens at Local Edition – the swanky basement bar in downtown SF – for a fun night of dancing & cocktails! No cover. 21+. Buy drinks. No partner needed. Beginners welcome. Bring a friend! ← February 21, 2018: One Night Swing Rueda Workshop & Party at Cat’s Corner / Ukrainian Hall!